DANA POINT — Many holiday activities are planned in Dana Point Harbor this season, but none will be bigger than the annual Dana Point Boat Parade of Lights, coming Dec. 7-8 and 14-15. The theme of the 38th annual event is “Lights, Camera, Action!” Participating boaters will get the chance to decorate sailboats, cruisers, dinghies and kayaks in a Hollywood-style holiday motif. 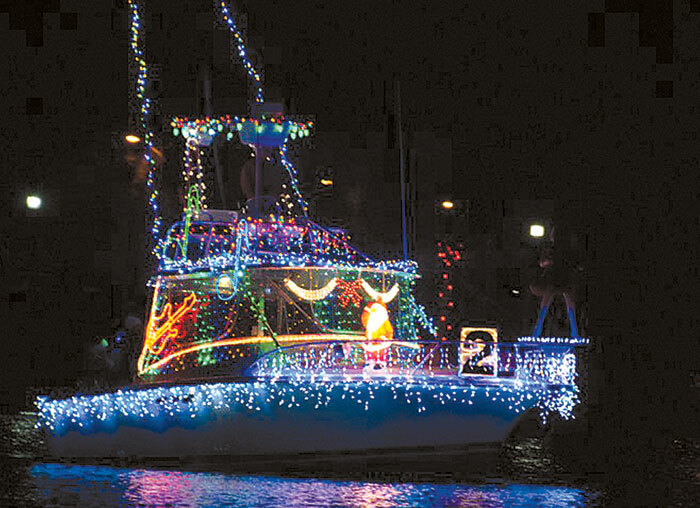 Each year, boaters from throughout Southern California compete in the parade’s decorating contest for awards, including Judges’ Choice, Best Theme, Best Use of Lights, Best Animation, Most Colorful, Most Original, Best Sailboat, Best Powerboat and the Perpetual Trophy for the yacht club with the most entries. Many other awards and cash prizes will be presented. Boaters planning to enter their boat in the parade can call (949) 496-5794, pick up an entry form at Dana Wharf Sportfishing, or visit danawharfsportfishing.com or danapointharbor.com. The parade will start at 7:30 each night of the event. An entry fee of $20 is required for boats participating in the parade. A skippers’ meeting is planned for 4:30 p.m. Dec. 2 at Dana West Yacht Club, where parade numbers and instructions will be given by the harbormaster, along with decorating tips. While boaters will get the best views, spectators can view the parade from shoreside locations throughout the harbor, and reservations can be made at local waterfront restaurants to view the procession of boats from a cozy and warm spot. Dana Wharf Sportfishing offers boat rides during the parade, departing from its docks at 34675 Golden Lantern. Tickets are $25 for adults; $15 for children 12 and younger. To reserve a seat, call (949) 496-5794. For more information, call the Harbor Info Line at (949) 496-5794 or visit danapointharbor.com. The Ocean Institute will present a Parade of Lights Holiday Cruise with jazz music from radio station KSBR 88.5 FM, from 7-9 p.m. Dec. 14. Participants can enjoy seasonal cheer and refreshments, and listen to holiday music while participating in the boat parade. The cost is $50 for adults; $40 for children ages 4-12. For cruise information and reservations, call (949) 496-2274, ext. 0. • Holiday in the Harbor Open House: This year’s event is set for 4:30 p.m. Nov. 30 at Mariner’s Village, Mariner’s Alley and Dana Wharf. The three areas will all host holiday activities geared to families and children, with many fun activities planned — including photos with Santa, performances by various characters, holiday crafts, live painting and a caricature artist. Activities start on the grass in front of Harpoon Henry’s at 34555 Golden Lantern. For more information, call (949) 923-2255 or (949) 496-2979, or visit danapointharbor.com. • Boat Rides with Santa: Participants can board boats departing from Dana Wharf Sportfishing docks for a 20-minute harbor cruise with Santa and his helpers. Santa will be hearing Christmas wishes, and parents will want to snap photos. Boat rides will be scheduled between 10 a.m. and 2 p.m. Dec. 1-2. A $3 donation to the El Camino Real Junior Woman`s Club is appreciated. For more information, call (949) 496-5794 or (949) 923-2255, or visit danapointharbor.com or danawharf.com. • Santa Paws: Pet Project Foundation will host the second annual Santa Paws event, where owners bring pets to have their picture taken with Santa for a small donation to support the Pet Project Foundation. The event will be held from 10 a.m.-3 p.m. Dec. 15. For more information, visit petprojectfoundation.org.